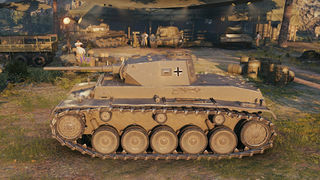 The Durchbruchswagen 2 is a German tier 4 heavy tank. Prototipo de un carro pesado, desarrollado por la compañía Henschel und Sohn. El prototipo fue construido en 1938. El prototipo se fabricó en 1938. En septiembre de 1939 se prefirió el proyecto VK 30.01, y se canceló el programa DW. Sin embargo, los prototipos del DW I y DW II fueron usados en varias pruebas hasta 1941. A fat tank, one of the most underrated for its poor mobility and awful gun selection. It is however not terrible - just takes some getting used to - and plays a lot like a KV-1, if always fighting in a high tier match when the gun is less useful. Sidescrape often by reversing; and do not peek out with the awful front armour, both glacis and turret are essentially aluminium sheets in the shape of a tin can. Once you cover the front, it plays a lot more like its cousins - just wait for the excellent guns of the rest of the Henschel range! The Durchbruchswagen 2 leads to the VK 30.01 (H). Comparatively good side and rear hull armor, effective sidescraping when reversing, takes surpisingly few criticals. Frontal hull armor is wet cardboard; not thick nor does it have slope. Poor maneuverability especially when stock. Grousers can be used, as can consumable fuel, and offroad driving. Unfortunately prone to engine damage, especially if frontal transmission plate is hit. Top speed also awful. Due to its fairly thin armor, it is recommended to avoid taking fire whenever possible. Sidescraping and reverse angling is good with the 50mm of side plate and should be used whenever the situation calls for taking hits or holding a choke point. Hull down is also marginally effective due to the top turret being fairly well armored with a decent mantlet, but cannot be relied upon to block any guns, especially with penetration such as those used by tank destroyers. If caught in the open, try to angle the tank at approximately 40-45 degrees to the enemy. With proper angling the tank becomes somewhat resilient to many guns that normally could pen the front head on, like scout autocannons. 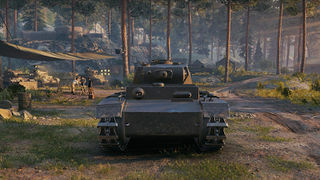 The tank is best used at medium ranges as neither weapon is effective at close range. 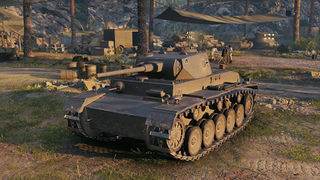 the most accurate weapon, the 50cm KwK 39 L/60 lacks the accuracy to be effective at extreme ranges but can hit weakspots from close to mid range. The 75cm KwK 37 L/24 is can be used in short range fighting; but is generally not the preferred choice as it has a slow reload, is incompatible with the bad mobility, and requires suppression support. It also cannot take out the heaviest of armour - for example, the ridiculous AT2 - because it cannot take out weakspots and HEAT is ineffective. For both guns, since all of the weapons lack penetration, flanking or targeting weakspots is essential, just as with the Panzer 3. Flanking can be effective but not very viable due to very low camo ratings and a lack of both speed and agility. If one's budget allows it, APCR can really turn this tank into a deadly machine due to the very good penetration of 130mm, enough to go through the front of almost any tank, up to tier V when aimed at the correct spot. Overall this tank should be played as a support zone-control heavy. Its job is to occupy rocks and blocks, reverse-scraping and teasing the enemies with the tracks, as its armor and maneuverability are both lacking. The guns have low penetration but can be viable when targeting weakspots or using premium ammo, either APCR/HEAT. Stay behind the main push, let heavier tanks take damage and deal with the first wave, and advance to secure locations once enemies are suppressed for the benefit of your team. Life gets better with stronger guns next tier! Focus on the turret, first mounting the tracks for sufficient load capacity.